3D Logic trains logical thinking and visualization. Link pairs of like-colored markers to complete the cube. Control the action using your mouse. To begin, click the Play Game button or link under the picture at left. This opens the game in a pop-up window. The idea is to connect pairs of like-colored squares. 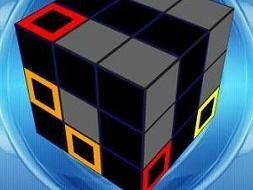 These squares can appear on three sides of the cube (the other three sides of the cube are hidden and not used). So far my personal best is reaching Level 16. See if you can top that! If you like this game, you might also enjoy Bloxorz or Candy Crush Speed Challenge. HOW TO PLAY. Look carefully at the location of each square, then think of the paths necessary to connect different pairs without overlapping any paths. One trick is to look for colored pairs that can be connected by following the outside edge of the faces of the cube. That leaves open interior pathways for connecting the remaining pairs. Left click for single square select. Left click and hold to select more than one square. 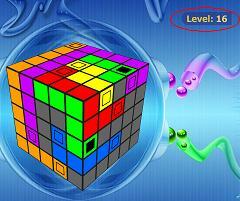 Move your mouse around the cube to rotate the cube. You cannot link cells diagonally. If you break an existing link reselect the broken link color by clicking on one of the two markers, then plug the gaps. Black cells are blocked. If you'd like to undo a move, click the Undo button at the bottom of the game. To clear all your previous moves, click the Clear button. Game distributed by FreeWorldGroup.com. Used with Permission.